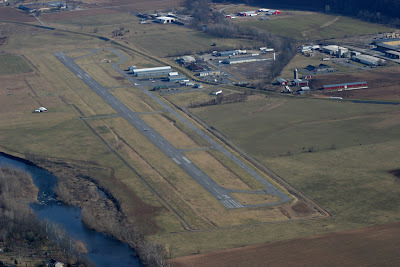 I spent last week at Grant County Airport (W99) in Petersburg, West Virginia for Wave Camp. I was fortunate to get instruction and some experience soaring in mountain wave lift as well as the opportunity to fly in winds and turbulence outside my comfort zone. Last Thursday afternoon, we managed to climb to almost 23,000 feet MSL in the club's ASK-21 sailplane. The aerotows through rotor turbulence were the roughest I've experienced in my brief soaring career. The character of the turbulence changed from day to day: on Saturday, we plowed into bumps with significant g-loads (peak +3.8 and -3.5g if I believe the g-meter), while on Thursday the jolts packed less punch (maybe +/- 2.5g) but they were constant and had more rolling moment as the towpilot flew up the valley in an attempt to escape the massive sink. We were flying in a washing machine. I have never seen a towplane jerk around like that. Slack line was unavoidable and control inputs to the stops were frequently required. It was good to see just how strong these gliders are. Once we entered the laminar wave lift, the ride was perfectly smooth and quiet. The wave steadily carried the ship up though 18,000 feet and we reset our altimeters to 29.92 inHg as we entered Class A airspace. I fished my cell phone from my pocket and used XCSoar to ensure that the sailplane remained within the window defined in the waiver with Washington Center. The view was like that from a seat on an airliner. The ridges below lost some of their significance; the terrain appeared more model-like than real. The lift was 500 ft/min at times, and in a few minutes we approached the top of the window at 23,000 feet. Still in about 2 knots of lift, only airspace limitations kept us from climbing further. Just below the ceiling I pulled the air brakes, maintaining a descent of 800-1000 feet/minute. Descending any faster would risk thermally shocking the cold-soaked glider as the air temperature warms at about 2 degrees Celsius every thousand feet. This was my first time breathing oxygen in the cockpit. The club's Mountain High distribution system began dispensing puffs into the mask at a pressure altitude of 11,000 feet and worked flawlessly. Solar heating in the cockpit kept me comfortable with just a few layers on. I didn't need my hat or gloves. My feet, however, were beginning to go numb by the end of the flight despite wearing insulated boots, two pairs of socks, and toe warmers. 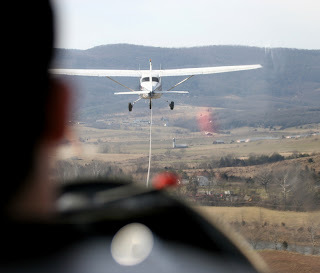 I would never have attempted a flight like this without a skilled instructor in the back seat. My policy is not to list names on this blog, but I am grateful for the soaring knowledge that was shared with me all week. I camped north of the runway, sleeping in my car. Though the temperature was in the twenties a few nights, I was comfortable. The pavilion (far left in the photo) had heated restrooms, hot water, and electricity. That's luxury camping to me. This was the first gathering of glider pilots that I've attended. There was lots of camaraderie and I learned something from everyone. What a great week! That sounds like an amazing experience, Paul. My mouth keeps making noise about wanting to get some glider experience, but I keep not doing anything about it. I wish there was viable glider training a bit closer to home. 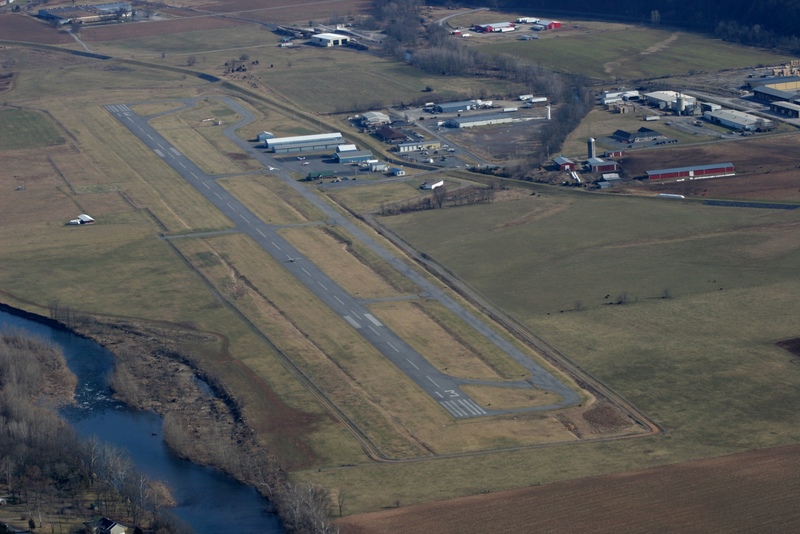 Well, if you ever find yourself in Virginia or happen to be stuck at Dulles on a nice weekend afternoon, let me know and I'll take you up in a glider at FRR. Thanks, Paul. There's some information there that I did not have, but the map confirms that the closest outfit to where I live is Finger Lakes Soaring, about an hour drive from my house. I checked them out a couple of years ago. They were very friendly. The entire club is run through member volunteers - a great idea, but a little time consuming for my current schedule when all I want is an introduction or to add on a rating. With other places being farther out, I concluded that my best bet would be to take a chunk of vacation and travel someplace.